1/4'' Apex power drive nutsetter, non-magnetic, 6 point square opening. Hex drive nutsetters from Apex Fastener Tools formally Cooper Tools, allow nutrunning in all types of applications. 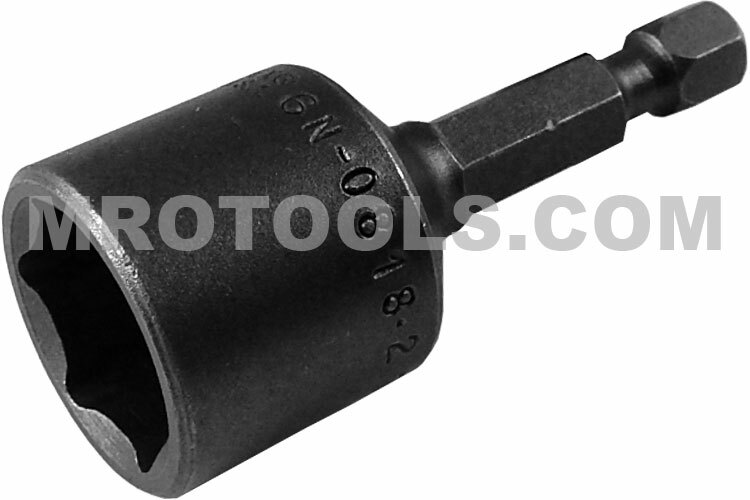 Nutsetters from Apex Fastener Tools feature a durable design and are constructed for a long service life. With Apex you are assured of an exact, sure fit. All nutsetters from Apex Fastener Tools have the tightest tolerances for straightness and concentricity in the industry. The 6N-0818-2 Apex 9/16'' Nutsetter, 1/4'' Power Drive is one of thousands of quality tooling products available from MRO Tools. Please browse Apex 1/4'' Power Drive Nutsetters, SAE, Non-Magnetic for tools similar to the 6N-0818-2 Apex 9/16'' Nutsetter, 1/4'' Power Drive. 6N-0818-2 Apex 9/16'' Nutsetter, 1/4'' Power Drive description summary: Apex 9/16'' nutsetter, 1/4'' power drive. Opening Size: 9/16'' Overall Length: 2'' Socket Nose Diameter: 13/16'' Quantity discounts may be available for the 6N-0818-2 Apex 9/16'' Nutsetter, 1/4'' Power Drive. Please contact MRO Tools for details.